Alon Shaya. Photo by Rush Jagoe. Alon Shaya’s multilayered Mediterranean cuisine has always required a deeper look, something I first discovered back in 2013 when I ate at Domenica, the Italian restaurant in New Orleans where Shaya was the chef at the time. His pastas were impeccable and his pizzas sublime, but the menu revealed influences from another, more exotic place. ​There was a whole head of fire-roasted cauliflower with whipped goat cheese, reminiscent of dishes I’d had in Tel Aviv. Buttermilk biscuits came dusted with za’atar, a spice blend with Levantine roots. And a little bowl of pungent olives studded with lemon rinds seemed more Machaneh Yehudah market than Tuscan countryside. ​“I was still cooking Italian food but I was in the process of figuring out my identity as an Israeli chef,” Shaya, 37, said by phone from New Orleans, where he’s lived since 2003. ​Like spring flowers pushing their way through a rocky field, those Israeli influences were hints of a blossoming story he shares in the new cookbook-memoir Shaya: An Odyssey of Food, My Journey Back to Israel , co-authored with Tina Antolini. ​It was a journey that required him to come to terms with his broken family and troubled teenage years before ultimately finding salvation as a chef, culminating in the 2015 launch of his namesake restaurant, Shaya, in New Orleans. In a city more known for Cajun and Creole fare, the fooderati of New Orleans swooned over Israeli-inspired staples like house-made labneh yogurt, hummus with curried cauliflower and chicken roasted with shawarma spices. In 2016, the James Beard Foundation recognized Shaya as the country’s best new restaurant. ​Unfortunately, in recent months an unsavory chapter has been added to the story. Last September, Shaya was fired from the restaurant, in which he was a partner with local restaurateur John Besh. 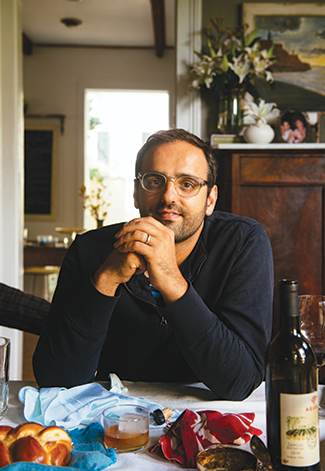 Besh co-owns and operates 12 restaurants in New Orleans and beyond, including Domenica. A few weeks later, Times-Picayune food writer Brett Anderson published the accounts of 25 women accusing Besh of fostering a culture of sexual harassment at his establishments. ​Once the allegations emerged, Shaya hinted to various media outlets that he had been fired in part for threatening to expose Besh’s behavior. That, in tandem with the fact that he had attempted to exercise an option to buy out Besh and run Shaya on his own, effectively ended a nearly 15-year professional and personal relationship. ​Shaya has been using his time away from the restaurant “to reflect on what is important,” he said, “and the people I surround myself with feel like a blessing.” He is currently focusing on his new catering business, Pomegranate Hospitality, the launch of his book and the plans for two new restaurants; Saba in New Orleans and Savta in Denver. ​Looking past this episode with Besh has required a firm resolve on Shaya’s part—and it is the same determination displayed in his new book. While I opened it expecting another glossy paean to luscious, modern Israeli food, what I discovered instead was a touching, initially sad and ultimately triumphant account of a lonely boy who found his life’s calling in the kitchen. ​ The book, which is arranged chronologically and whose recipes are not generally kosher, introduces us to a young Shaya just after he, his sister and his Bulgarian-Israeli mother moved to Northeast Philadelphia from their native Israel. There they joined his Hungarian-Israeli father, who had arrived two years earlier to work in a machine-repair business. ​His parents separated soon after, and he became a latchkey kid with limited contact with his father. His warmest memories are of his maternal grandparents’ visits from Israel, when Shaya would cook with his savta, who recruited him to prepare vegetables for her Balkan specialties. “I sat there and peeled and felt that life was better,” he writes. ​Shaya began cooking as a way to fill the empty hours alone at home: baking hamantaschen from a recipe his mother dictated over the phone, frying up latkes, experimenting with a range of foods. Though cooking brought him comfort—and he eventually reconnected with his father on weekend fishing trips—it wasn’t until he was mentored by a tough-love home economics teacher that he considered food as a career. He found his way to the Culinary Institute of America, where he co-founded the school’s first-ever Jewish Culture Club. ​Shaya cooked in Las Vegas and St. Louis before moving to New Orleans. Not long after he arrived, Hurricane Katrina decimated the city, and he prepared thousands of meals with his team for the volunteers rebuilding the devastated Ninth Ward. ​Soon after Katrina, Shaya met Emily Ostuw at a Jewish federation young leadership mixer; they married in 2012. “For a time, we became the poster children for the New Orleans Jewish Federation,” joked Shaya. The couple belongs to a local synagogue and attends holiday services. They host friends every Monday for a traditional New Orleans meal of red beans and rice. “It’s our version of Shabbat dinner since I am usually working weekends,” said Shaya. ​In past years, Shaya hosted Passover seders first at Domenica and later at Shaya. For your seder, try these delicious recipes from Shaya’s book. 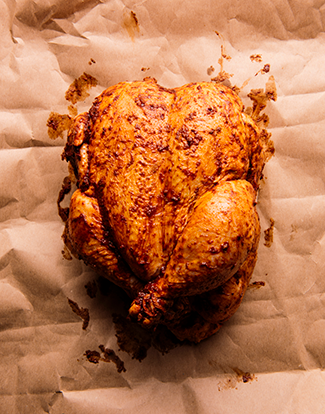 A roasted chicken slathered in herbed salt and harissa makes an elegantly simple entrée. 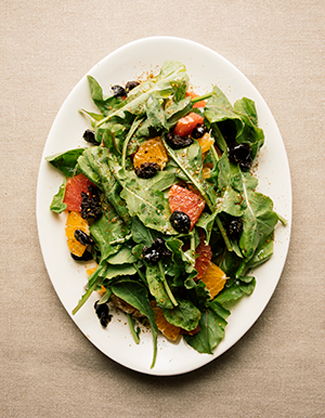 The citrus-spiked arugula salad seasoned with za’atar—a blend of sumac, hyssop and other spices that is kitniyot if containing, as it often does, sesame seeds—offers a fresh burst of spring in each bite. Adeena Sussman is a cookbook author and recipe developer based in Tel Aviv. Her latest cookbook is Short Stack’s Tahini. 1. Pat the chicken dry inside and out, then pat the herb salt evenly all over the bird. Place it on a plate with the breast side up and refrigerate, uncovered, for at least a couple of hours and preferably overnight. 2. Heat the oven to 325° with a rack in the lower-middle portion of your oven. Set a roasting rack inside a roasting pan, and pour the water into the bottom. If you don’t have a roasting rack, any slotted rack that keeps the bird elevated from the roasting pan will work. 3. Truss the chicken (if you’ve never done this, there are plenty of easy tutorials online, and doing so will ensure that it cooks evenly), and rub the harissa all over the skin. Set it in the rack, again with the breast facing up, and roast it for about 1 1⁄2 hours, until you can easily pierce the leg meat with a knife. 4. Take the pan out of the oven, and bump the heat up to 450°F. Once it’s come to temperature, roast the chicken for another 15 to 20 minutes, until the internal temperature of the chicken breast is 160°. The skin will be nicely crisped up with good color, the harissa almost blackened in some areas. 5. Let the chicken rest for 10 minutes before carving it on a rimmed platter or cutting board (it may give off a lot of juice). Cut the lime into wedges, and serve them on the side along with more harissa. 1. Run everything in a food processor until it’s all finely and evenly chopped. 2. To keep the salt bright green, with that same fresh, lively flavor, store it in a ziplock bag in the freezer; it will last for months. 1. Peel and halve all the citrus, then lay the halves flat and use a serrated knife to cut them very gently into 1⁄2-inch slices. Set them aside. 2. To make the dressing: Grate the garlic into a bowl, then add the lemon juice, honey, ginger and salt. Whisking all the while, stream in the olive oil so that the dressing emulsifies. 3. Toss the arugula and olives in the dressing until they’re coated. Pile on the citrus, and sprinkle the za’atar all over as a garnish. Recipes excerpted from ‘Shaya’ by Alon Shaya. © 2018 by Random House. Excerpted by permission of Alfred A. Knopf, a division of Random House LLC. All rights reserved. Photos by Rush Jagoe. Your enticing review does state: the recipes are not all kosher. But you might have noted that they include pork and sea food, and that these “mega-transgressive” foods are pictured. Meaning they book couldn’t really find a happy place on my bookshelf.